Well, it’s January and with it brings Eden’s 12th birthday. I can’t believe it….she is already booked for her first babysitting job. Now that the kids are getting older, they aren’t very interested in the “over-the-top” theme parties that I used to do. I still like to make a nice invitation and cake, but the theme related games, decorations and activities seem like they are becoming nothing more than a distant memory. How sad! I used to love pulling those parties together ~ maybe I’ll be a Party Planner in my next stage of life? We hope to finalize some plans and pull things together for finalizing her plans for this year, but I know that my role is progressively becoming less significant as the girls are quite happy just to hang-out and amuse themselves, but in honour of her January birthday I thought I would share some ideas from one of her past parties. I need to begin by saying that this was early on in my birthday party planning craze and I was not yet adept at making sure every single detail was taken care of. She didn’t have a birthday party with friends until she started pre-school. Because the party was primarily adults, there weren’t any games, activities or loot bags. I have included some of the ideas I used for Eden’s party, but have also included several others that I either thought of or found on the web. This party was back in the “olden days”, pre-digital camera and I couldn’t find the negatives anywhere. I am embarrassed to say that the pictures I am sharing are photos of photos. How tacky! Anyway, no other choice. I was also quite surprised to learn that I don’t even have a full picture of the birthday banner. I think I got better at taking photos of everything, as I did more parties. 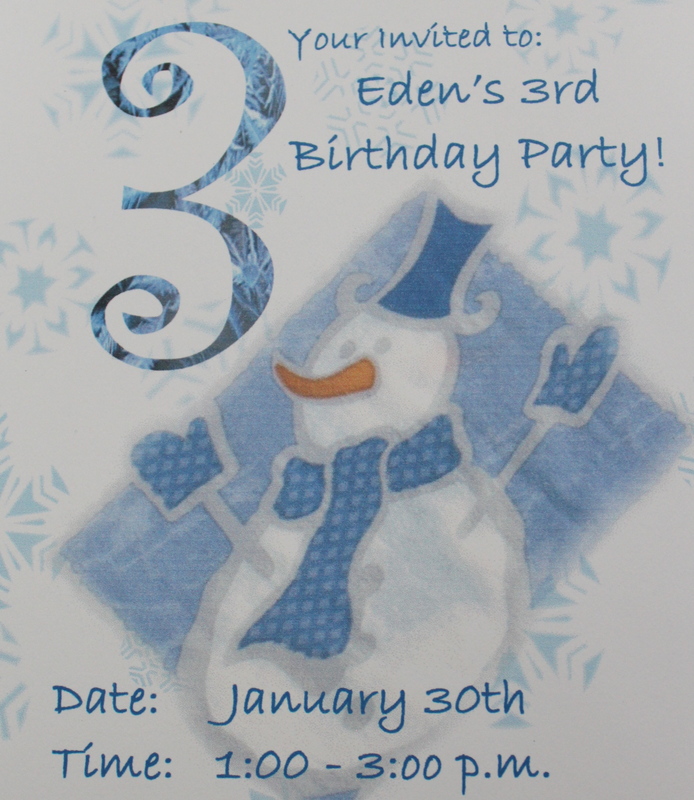 There really is nothing fabulous about the invitations I did for Eden’s party. I was not yet into card making and thought I was brilliant because I scanned the napkin so that the invitations matched the napkins. They were fine, but nothing special. I would do something totally different now that I am into scrapbooking and card making. If you simply google “snowman birthday invitations” under images, you will see hundreds of great ideas. You can also refine your search to “homemade snowman birthday invitations” for even more ideas. I often search the web for ideas before coming up with my own. Again, I don’t seem to have great pictures from the party, but below are a few of my favourite party ideas from her snowman themed party. I always make a huge hand-painted birthday banner that is theme related. This might have been the first year I started this tradition! I don’t have a picture of the whole banner, but I remember it was on black with both light blue and white paint. My favourite part was the snowman family in the bottom left corner. Each member of our family made a footprint and then I added the details to make them into snowmen for the banner. Of course, there were snowflakes painted on the banner as well. After the party, I cut-out Eden’s footprint and included it in the scrapbook layout from her 3rd birthday party. The foot print is a great memory in itself. I did something similar for Shay’s pirate birthday with a hand print parrot on his banner. For this party, I wanted to have an indoor snowman for photo opps. I purchased a large white Christmas tree bag over the holidays and then we stuffed it with shredded paper. It worked fine, but it was quite a bit of work collecting enough paper and you really had to have white or it showed through. If I were doing it again, I would use some of the other great ideas I found on Pinterest for making indoor snowmen. When I think back to the planning of her party 9 years ago, I realize how much has changed in terms of technology. I did find some ideas on line back then, but the ideas (especially the images) were quite limited. Social media sites like Pinterest have made it so much easier to share great ideas. For the centrepiece on the table, I made a snowman ice sculpture. I froze water in balloons (with varying amounts of water in each) and then melted the flat side slightly so that the balls would adhere to one another. This worked perfectly. I added the embellishments the same way…..I slightly melted the area I wanted to adhere the eyes and then attached them. I did prepare the snowman ahead and re-froze him on my steps. Very cute! I really don’t have a picture of them, but I had also used plain white balloons that I decorated with a face and hat so that they all looked like snowmen. They also turned out well. Here are a few pictures from Eden’s Snowman Party. You can see Eden’s birthday banner in the background of this picture. This “handprint” parrot was on a Pirate Party Birthday Banner that I made for Shay. Click the image to see the Pirate Party post. When preparing for this post, I found so many other great ideas. If I were doing another Snowman party, I might consider including some of these great ideas. For more creative indoor snowman ideas, visit Amazing Interior Design. As mentioned earlier in the post, I didn’t plan anything for our party as Eden was only 3 and it consisted primarily of adults and older kids. However, being a teacher, I can tell you that there are many great ideas based on a winter/snow/snowman theme. Pinterest is always a great source, but here are a few that I came up with quite quickly. Of course, you would need to pick activities that are age appropriate. Snowman Game using toilet paper and accessories to dress each other up like snowmen. Check this and other great snowmen ideas out at Fun on a Dime! There are so many fabulous ideas for this theme, I could go on forever, but I am becoming deeply saddened that I will probably never get to plan another snowman party again. Rats! I would do it SOOOO much better if I had another chance. For Eden’s party, I opted for a 3D snowman cake. I wanted a really bright white icing and so I used my mom’s recipe for 7-Minute Frosting. I find it a bit sweet now, but it was my favourite when I was a kid. Again, you can search for all kinds of great cake and cupcake ideas, but here is a picture of Eden’s cake. I actually can’t totally remember what I made the hat out of, but I want to say a “wagon wheel” with chocolate cookies stacked on top?? The hat is very dark in all of the pictures and I made this cake 9 years ago, so I don’t exactly remember. I still have the print out of the recipe and directions, but I know I did a bit of my own thing as well. I tried to find the link, but the page is no longer there. Sorry! Again, this is certainly not one of my better cakes, but I guess it illustrates my growth and development….let’s celebrate that! What drives me the most crazy is that I actually left the finished snowman displayed on a messy plate. I can’t believe I wouldn’t have cleaned-up the icing drips and crumbs ~ what was I thinking? snowman soup (hot chocolate, marshmallows, candy stick (candy cane), chocolate kisses). There is a little poem to go with this, but it is a bit more geared to Christmas. I am sure it could be modified. I have sometimes made these as little Christmas gifts. This is theme is so much fun and the ideas are literally endless. So, if you have a winter birthday party to plan why not plan your own snowman party? Posted on January 12, 2014 by Cindy Roy •	This entry was posted in Birthday Parties and tagged birthday party ideas, birthday party planning, snowman, snowman birthday party, snowman cake, snowman ice sculpture, snowman party decorations, snowman party loot bags, snowman party theme, winter birthday party ideas. Bookmark the permalink.